This is my jam lately - literally everything falls into the "favorite" category of my closet. Downsizing has has many down-sides (excuse my pun), but falling in love with my closet all over again isn't one of them! This camel coat has made me enjoy the transition to cooler temps like never before. What piece is making your slide into the polar plunge more doable? I really love that scarf...so pretty! Even I am with you for a getaway. The scarf loks perfect, great dress. Love all the colours. Perfect shoes and coat! You look wonderful! You are chic like nobody's business! Ohhh, I love everything about this! Great coat, I love it with your fur scarf! I've got a neutral fur stole like that that I've been pairing with everything. Warm + cute = win. Love the door handles on that restaurant! Almost as I love a good camel colored coat. This coat is gorgeous on you. 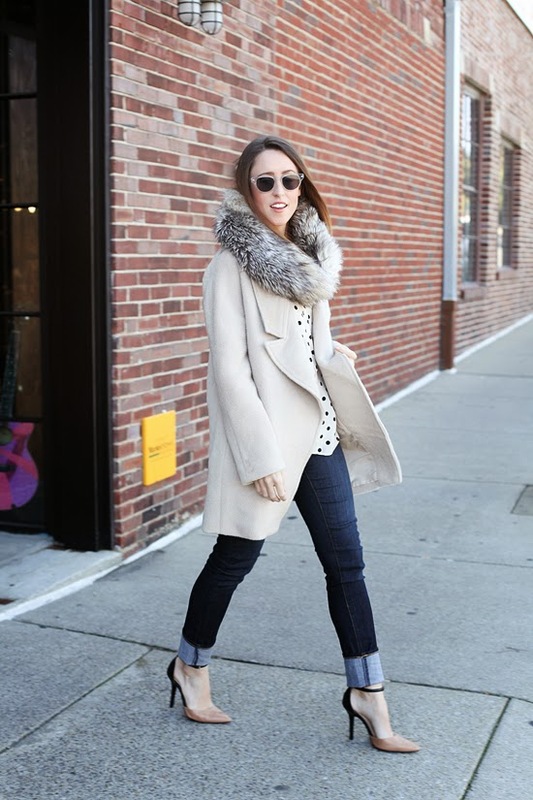 I'm in love with everything about this outfit, but especially the camel coat and scarf. Lovely.